1. Select the foreground element around which you want to create the halo. Then choose Select ^ Inverse to deselect the foreground element and select the background. 2. Press Q to switch to the quick mask mode. 4. Choose Filter ^ Blur ^ Gaussian Blur. Then enter a Radius value 0.1 less than the amount by which you increased the size of the deselected area. In my case, I entered 14.9. This cuts into the image slightly, but hardly enough to be visible, as you can see in the image on the left in Figure 11-2. Figure 11-2: Create a heavily feathered selection outline (left) and then apply the Crystallize filter to refract the feathered edges (right). 5. Choose Filter ^ Pixelate ^ Crystallize. Enter a moderate value in the Cell Size option box. I opted for the value 12, just slightly larger than the default value. After pressing Enter, you get something along the lines of the selection outline shown in the right image in Figure 11-2. The filter refracts the softened edges, as if you were viewing them through textured glass. 6. Switch back to the marching ants mode. Then use the selection as desired. I merely pressed Ctrl+Backspace to fill the selection with white, as shown in the top-left image in Figure 11-3. 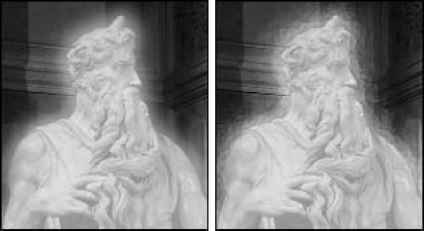 Figure 11-3: Which aura will Moses don today? The images illustrate the effects of applying each of four filters to a heavily feathered selection in the quick mask mode and pressing Ctrl+Backspace. 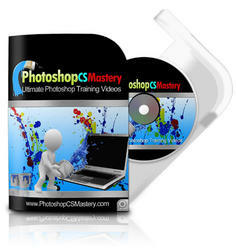 You may find this technique particularly useful for combining images. You can copy the selection and paste it against a different background or copy a background from a different image and choose Edit ^ Paste Into to paste it inside the crystal halo's selection outline. Figure 11-3 shows several variations on the Crystal Halo effect. 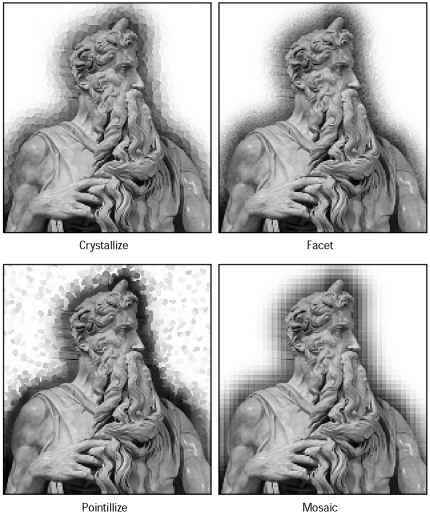 To create the upper-right image, I substituted Filter ^ Pixelate ^ Facet for Filter ^ Pixelate ^ Crystallize in Step 5. I also sharpened the result to increase the effect of the filter (which nevertheless remains subtle). To create the lower-right image, I applied the Mosaic filter in place of Crystallize, using a Cell Size value of 8. 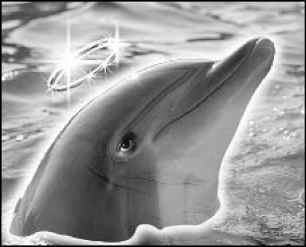 Finally, to create the lower-left image, I applied the Pointillize filter. Because Pointillize creates gaps in a selection, I had to paint inside Moses to fill in the gaps and isolate the halo effect to the background before returning to the marching ants mode.